Could it be? | House Unseen. Life Unscripted. I'm wondering if this is really finally it. A few minutes ago I dowloaded the Pandora and Spotify apps onto my ipod because what fun is it to be in labor if you don't troll other people's carefully crafted l&d playlists? Now I think I'll go have a little date with my flattening iron. If that goes well, maybe a follow-up meeting with a tube of concealer and some lip gloss. A girl has to have her priorities, okay? I know you're worried so let me assure you- the straightening went well. I had to IG a pic just in case this is finally the real thing of course. concealer- check. lip gloss- check. a little eyebrow tweezing- check. How presh is this picture of Mary? 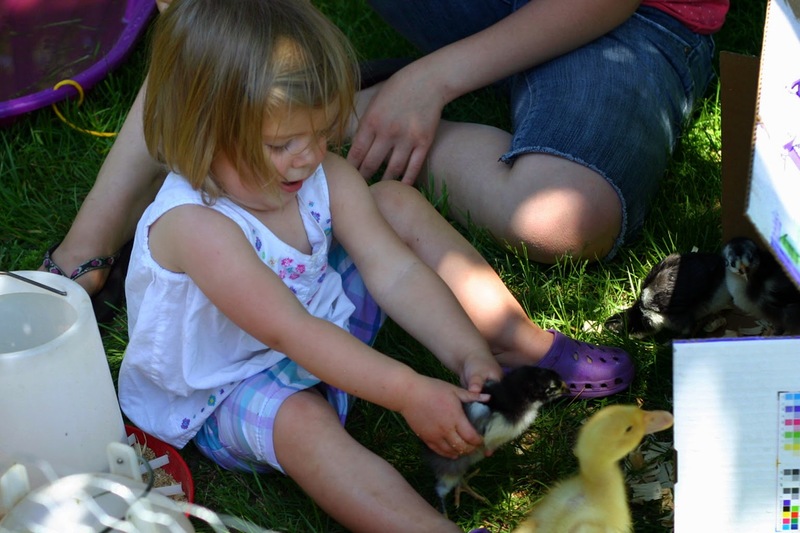 This was the first day that the new ducklings and chicks got to explore the great out of doors (read: a small pen set up inside our front yard) and everybody just had so. much. fun. Sigh. I don't know. I feel like yes, then I feel like no. As always these days. Maybe I'll pause the music and give sleeping another try? Boy it pains me to even mumble such a thing. Forget it. I don't know if I'm really in labor or not, but sleeping ain't happening. Me and Julio Down by the Schoolyard is playing right now. Oh. Em. Gee. How I do love Paul Simon. So, I guess I've been up all night. Even if baby decides not to come today, I'm probably going to need your prayers to make it through the afternoon without melting down in a pile of pathetic, self-pitying, sleep deprived goo with no newborn to snuggle. If this DOES turn out to be IT (still undecided. I know. How? How can I have gone through real, uninduced, productive labor so many times and still be uncertain about these things? ), I'll need your prayers for a different reason. See y'all on the other side...of something! Offering up my extra-early morning with a feverish baby for you! Oh Dwija, I cannot even imagine how exhausted you are right now (well, ok, I can imagine, because the one time I did the prodromal labor thing was the most exhausting experience of my life). I will pray pray pray that this goes somewhere sooooooooooooooon! Praying! And I'm laughing that, up all night with maybe labor starting, you blogged it. Hoping you'll meet that little one soon! Glad to hear I'm not the only one who had trouble telling if I was in labor. God was kind and gave me a sure sign: my water broke...translation; there was a massive watee-broke mess and even then when I wasn't positive he sent ALL THE PAINFUL contractions. Yep, time to go to the hospital. My precious boy #2 kept me up last night too. Why is it that little babies like to be up in the nigbtime, yaknow...to play! Praying for you and for a quick, uncomplicated, soon to start labor. Hang in there!!!! Prodromal labor is the pits - I hope this is the real thing for you now!!!!!!!! The only thing that helped me was to walk until the contractions got regular. Praying this is it! And also, June 4th is a lovely day for a birthday. My daughter, Sarah, is 10 today! LOVE the ducklings, LOVE that you are on your way - you ARE on. your. way. okay??? So looking forward to any and all updates!! Praying for you, Dwija - I mean it!! I am sure this is your real thing. Even if your real thing lasts for 3 days this is the beginning. I'm certain. Your 2 hour rest was your body preparing. :) Many prayers coming the way of Michigan! Pins and needles. Pins. And. Needles. Oh, you sweet, sweet woman. Up all night is nooooooo fun. Put movies on for the kiddos and sleeeeeeeep. Precious baby will come soon. XOXOXOXOXO praying for you! Those contractions you are feeling are opening you up so the REAL thing will be short and sweet! We'll keep praying for you!! I hope you get a chance to rest today. It's brutal trying to function on no sleep :( Hang in there, friend. Big prayers coming your way, mama Dweej. Praying for you! You are amazing! Prayers for rest and for sweet snuggles sooner than later!